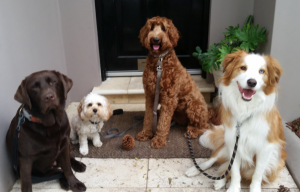 Hi everyone, my name is Francine and I have been a trusted and reliable dog walker in Surry Hills for 3 years. I started this business after resigning from my office job. I spent my days walking my dog Snappy, and realised I wanted to work with dogs, because I had so much love for my dog, I wanted to work with something I was passionate about. ​Safety is my number one priority for your dog. I will only let them off the lead if I have permission and if I am certain they will come back. I always have treats with me so your dog will be rewarded for good behaviour. Guaranteed active dog walks on the lead or chasing the ball. If you have an older dog we can fit them into a more chilled walk. I send photos on every walk if you’d like to see your dog out and about! Please don’t hesitate to contact me if you have any questions. I have references from my current and previous clients.